Sunday April 1st 1900 I was busy about the work all the forenoon and read in the afternoon and evening The weather a little more pleasant. Monday April 2nd 1900 Luther helped me wash in the morning and we had dinner early. Will and I went up to Elmer Andersons in the afternoon. They are neither of them well. Got home to do evening work. Tuesday April 3rd 1900 Luther helped me wash the last feather bed today We did not finish till after dinner. I then cleaned up the house, and did some extra work about the house. This was Brother Robs birth-day. Wednesday April 4th 1900 Will went to town today, before he went he fixed the ash barrel for me. I worked out doors most of the day. 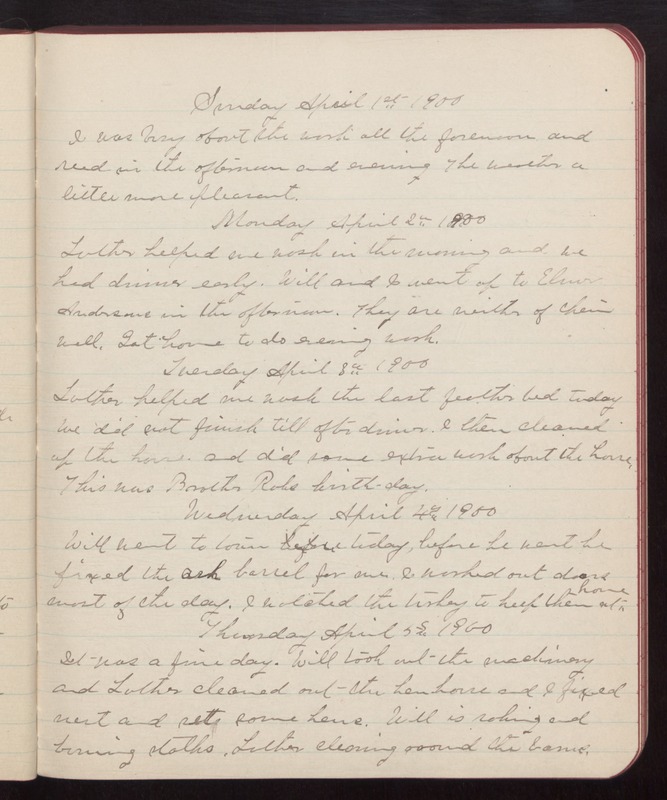 I watched the turkey to keep them at home Thursday April 5th 1900 It was a fine day. Will took out the machinery and Luther cleaned out the hen-house and I fixed nest and set some hens. Will is raking and burning stalks. Luther cleaning around the barns.